We often hear about some bizarre records that are listed in the Guinness Book of World Records. 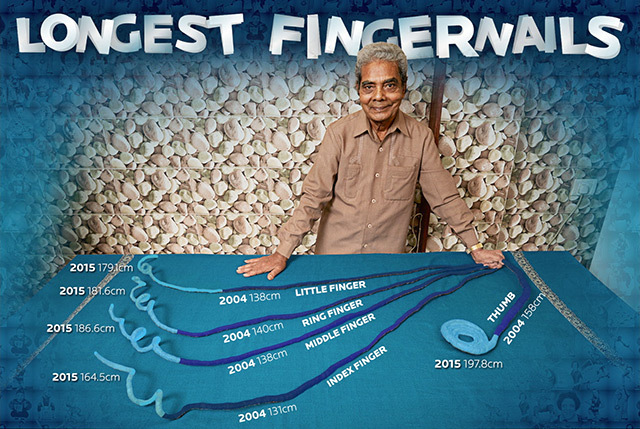 One such weird record is documented for a man having the longest fingernails in the world. Shridhar Chillal is the one who has managed to preserve the nails of his left hand, for over 65 years. Now, he is planning to cut them off and set them for display in a museum. Take a look over the journey of his life that was not so easy, as it sounds. For every challenge we need a motivation to succeed. Shridhar got the motivation to grow nails from his teacher. This statement by his teacher posed a challenge in front of Shridhar and his friends, and they started to grow their own nails. It has been 65 years since then (1952), he didn’t cut the nails of his left hand. As the length of his fingernails grew, the problems in his life were also increasing. Family insisted him to cut them off and his teachers too opposed him. But, Shridhar by then had already decided that he would never cut his nails again. Also, no one was ready to employ him. At the time he was supposed to get married, nobody was willing to marry him. He saw about 10-12 girls, out of which, even if the girl is ready, her parents would warn that he might strangle her neck. On the other hand, if the parents agreed, the girl would call him a dirty person and refuse. Read The Struggles face by a Rickshawala, is the Government listening? Finally, his elder brother’s sister in law agreed to marry him at the age of 29 and the approach to his ambition was changed. The criticism he faced before, existed no more. He claims, his appearance in the Guinness Book of Records, remains one of his biggest achievements. His entry into the records made him so popular that he wouldn’t need to stand in the queue for anything, people know him and they let him go ahead. To perform an adjudication of the record, Guinness World Records team visited Shridhar’s home in Pune, Maharashtra on the 17th of November, 2014. It was found that the combined length of his fingernails on left hand, was 909.6 Centimeters with the thumb nail measures an unbelievable length of 197.8 centimeters. The counting was done using a string, so that it can be rolled over his nails easily and then the string was measured using a tape to talk of the numbers, in centimeters. Now that, Shridhar has grown very old, and his nails too are turning fragile and he could not earn enough due to longer nails, he said he would give them to the museum and earn some compensation for a living. Anyway, the journey of his life might be a difficult one, but he never thought he would be famous globally for his nails, which was opposed by everyone. So, this was a glimpse of the life of Shridhar Chillal, with a weird goal and record breaking accomplishment he has achieved what he wanted. Do you know any such bizarre events or achievements that you would like to discuss with us? Let us know in the comments below and share it with your friends if you like it. Next articleEffects Of Light Pollution: Why You Must Care?